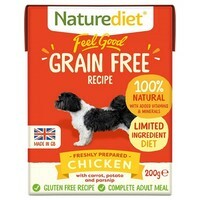 Naturediet Feel Good Grain Free Chicken is a nutritionally balanced complete meal made with British Chicken and a tasty trio of Root Vegetables. Created for dogs with allergies, intolerances and sensitive tummies, the gently steam cooked grain and gluten free recipe contains all of the essential vitamins and minerals needed for a healthy diet. Naturediet Feel Good Grain Free Chicken is appropriate for all breeds of adult and senior dogs, especially those requiring a single protein or low purine diet.